Here are some snazzy birthday facts about 30th of September 1997 that no one tells you about. Don’t wait a minute longer and jump in using the content links below. Average read time of 10 minutes. Enjoy! What day was my birthday Sep 30, 1997? September 30, 1997 was a Tuesday and it was the 273rd day of the year 1997. It was the 39th Tuesday of that year. The next time you can reuse your old 1997 calendar will be in 2025. Both calendars will be exactly the same! This is assuming you are not interested in the dates for Easter and other irregular holidays that are based on a lunisolar calendar. There are 162 days left before your next birthday. You will be 22 years old when that day comes. There have been 7,873 days from the day you were born up to today. If you’ve been sleeping 8 hours daily since birth, then you have slept a total of 2,624 days or 7.19 years. You spent 33% of your life sleeping. Since night and day always follow each other, there were precisely 267 full moons after you were born up to this day. How many of them did you see? The next full moon that you can see will be on May 18 at 21:13:00 GMT – Saturday. Fun stat: Your first one billion seconds (1,000,000,000) will happen sometime on June 8, 2029. If a dog named Penny Lane - a Alaskan Malamute breed, was born on the same date as you then it will be 130 dog years old today. A dog’s first human year is equal to 15 dog years. Dogs age differently depending on breed and size. When you reach the age of 6 Penny Lane will be 45 dog years old. From that point forward a large-sized dog like Penny Lane will age 5-6 dog years for every human year. Jack the Ripper kills his third and fourth victims, Elizabeth Stride and Catherine Eddowes. James Meredith enters the University of Mississippi, defying segregation. The Lockheed L-100, the civilian version of the C-130 Hercules, is introduced. BBC Light Programme, Third Programme and Home Service are replaced with BBC Radio 2, 3 and 4 Respectively, BBC Radio 1 is also launched with Tony Blackburn presenting its first show. The first images of a live giant squid in its natural habitat are taken 600 miles south of Tokyo. What does my birthday September 30, 1997 mean? 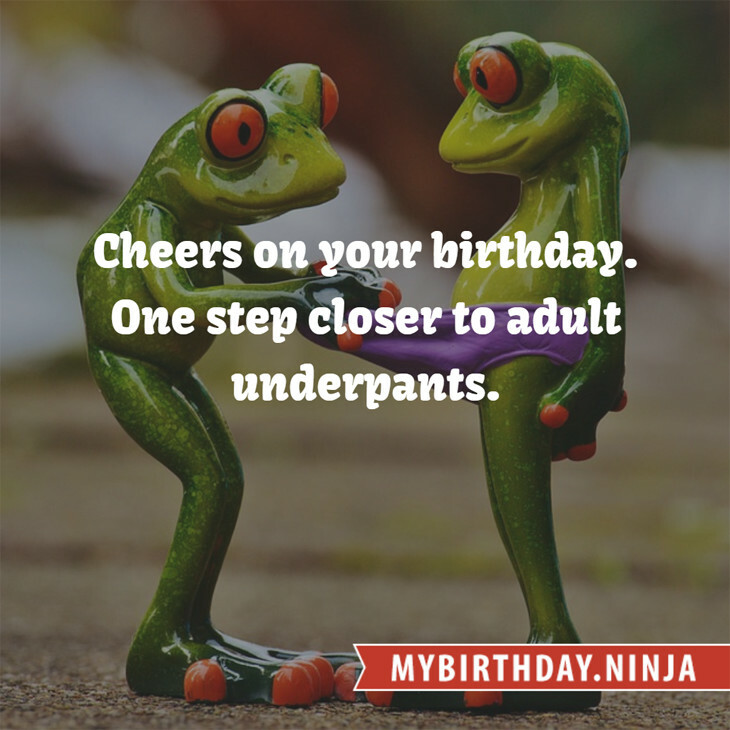 Your birthday numbers 9, 30, and 1997 reveal that your Life Path number is 2. It represents balance, harmony and partnership. You have the soul of an artist. You are a fine companion and possess a good sense of humor. Friends seek you out for your calming and peaceful company. The following celebrities also have the same life path number: Heo Young-saeng, Janet Gardner, Jessie J, Lee Shallat-Chemel, Chill Wills, Wilhelm von Homburg, Burt Kwouk, Anthimos Ananiadis, Lauren Bennett, Dagmara Domińczyk. 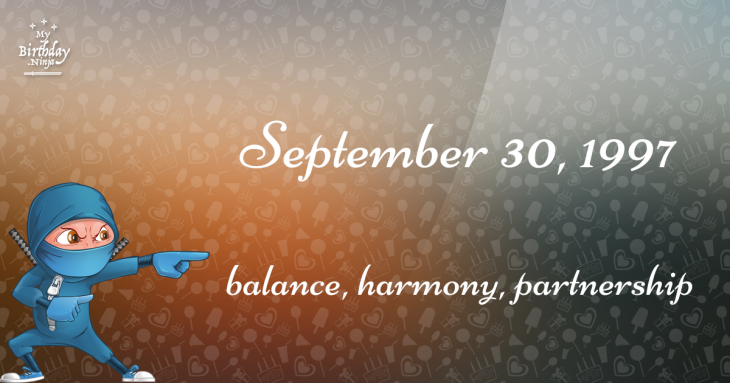 What is the birthday horoscope for Sep 30, 1997? The Western zodiac or sun sign of a person born on September 30 is Libra ♎ (The Scales) – a cardinal sign with Air as Western element. The ruling planet is Venus – the planet of love and beauty. According to the ancient art of Chinese astrology (or Eastern zodiac), Ox is the mythical animal and Fire is the Eastern element of a person born on September 30, 1997. Fun fact: The birth flower for 30th September 1997 is Aster for memory. The number-one hit song in the U.S. at the day of your birth was 4 Seasons of Loneliness by Boyz II Men as compiled by Billboard Hot 100 (October 4, 1997). Ask your parents if they know this popular song. I do not know how you feel about this, but you were a male ♂ in your last earthly incarnation. You were born somewhere around the territory of Austria approximately on 1300. Your profession was warrior, hunter, fisherman, executor of sacrifices. How many babies were born on September 30, 1997? Base on the data published by the United Nations Population Division, an estimated 130,906,795 babies were born throughout the world in the year 1997. The estimated number of babies born on 30th September 1997 is 358,649. That’s equivalent to 249 babies every minute. Try to imagine if all of them are crying at the same time. What is the popular baby name on 30 Sep 1997? Here’s a quick list of all the fun birthday facts about September 30, 1997. Celebrities, famous birthdays, historical events, and past life were excluded. Try another birth date of someone you know or try the birthday of these celebrities: October 17, 1983 – Riki Miura, Japanese actor; December 15, 1932 – Jesse Belvin, American singer-songwriter and pianist (d. 1960); April 10, 1996 – Audrey Whitby, American actress and screenwriter.